Located in one of Australia’s most sustainable wine regions, McLaren Vale’s popular Wirra Wirra winery have perfected the biodynamic production of its grapes while building a leading reputation for quality wines. 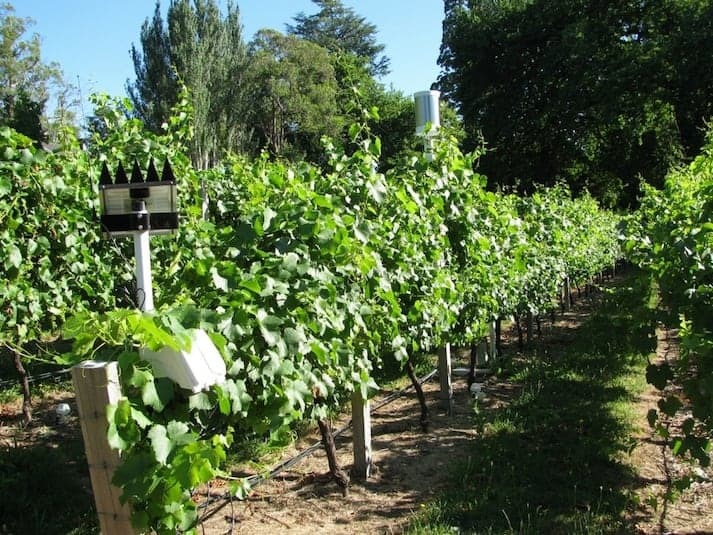 Former vineyard manager, Tony Hoare, identified a series of benchmarking programme by which grape quality could be improved using a regulated deficit irrigation strategy. Knowing when and how much to irrigate according to growth stage allowed Tony to manipulate the critical phenological stages of his vines, control disease, and fertigate efficiently. These viticultural insights all began with visualising the water content below ground using Sentek’s soil moisture monitoring technology. Tony chose to install 4 EnviroSCAN probes dedicated to Wirra Wirra’s flagship Shiraz blocks, and an additional 42 sites throughout the property where measurements could be taken using Sentek’s portable Diviner 2000 probe. Soil moisture data obtained from the vineyard was stored and graphically analysed with Sentek’s IrriMAX software. Using Sentek probes, Tony was able to precisely match the water required to his deficit irrigation strategy over the growing season. Flowering and fruit set stages were regulated in a four week period of no water stress, maintaining soil moisture just below full point. In the following three months, Tony initiated his deficit irrigations, gradually reducing soil moisture throughout the profile. Bringing vines close to the threshold of water stress in this phase was critical to the achieving the desired colour and flavour of the grape. Finally, from veraison to harvest, soil moisture was replenished and canopy vigour was reduced to ensure sugars, anthocyanins and overall grape tugor were developed in the ripening stages. Measuring soil water and its availability to vines delivered new knowledge to Tony that ensured the long term viability of Wirra Wirra’s vineyard through improved soil management. Maximising water use efficiency and achieving high quality fruit production substantially increased Wirra Wirra’s market position as a leading South Australian winery. The irrigation strategies implemented by Tony with the help of Sentek probes increased Premium Shiraz blocks to a Super Premium grape quality, and eventually an Ultra-Premium grade. This incredible achievement allowed Wirra Wirra to penetrate high-end markets, meeting the demand for Ultra-Premium wines with sufficient quantities.